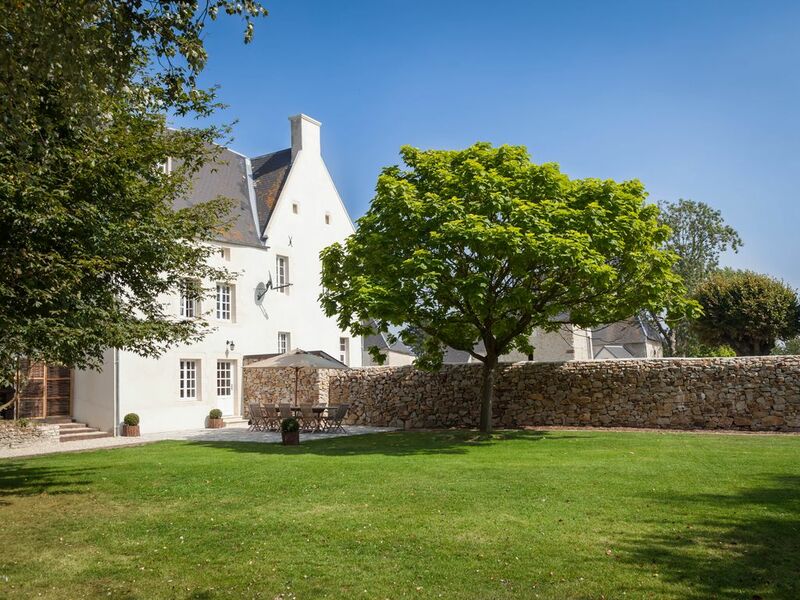 Ideally located close to the millennial city of Bayeux and only a few kilometers away from the American D-Day beaches, Le Clos de Blisse offers the perfect base to discover the historical and cultural treasures of Normandy. Juno Lodge, Utah House and Omaha Mansion are the three guesthouses available within the 8-hectare property. With no vis-à-vis, each benefit from its own private garden and terrace. All are state-of-the art renovations of 18th century buildings dating back from the French Revolution. Whilst retaining many original features, they provide the highest modern comfort (underfloor heating, wifi, apple tv). Overlooking the water and the surrounding Norman countryside, the outdoor Nordic hot tub and sauna will make of your holiday the most relaxing stay. We spent a week in the Utah house in June and were able to take a look at the omaha mansion and the bakery lodging as well. All three are spectacular. Our family of 5 had plenty of room and the home was immaculate. The pool is beautiful and the kids loved rowing the row boat around the pond. Samuelle has done a top notch job in designing, decorating and furnishing these homes. They are rustic but refined and give you a sense of history while still having modern luxuries blended seamlessly into the homes. Having fresh bread and croissants delivered from the bakery in the morning was delightful. Samuelle and her family are wonderful hosts. I highly recommend staying in one of Samuelle's beautiful homes for your visit to Normandy. We absolutely loved our stay at Le Clos de Blisse. My husband and I stayed in the Omaha Mansion and my daughter and her family stayed in the Utah House. Both houses were beautiful and the setting couldn't have been better. My grandchildren loved the fenced in backyards both with playsets. We loved the gourmet kitchens which were fully stocked with everything you could possibly need. We were close to everything we wanted to see. We were within a easy day trip of Mont Saint Michel, Honfleur, Bayeux, Cherbourg and the D-Day Beaches and American Cemetery. Samuel was a wonderful hostess, she was very helpful and always there if you needed her. She also has another property that she just started renting out. The Juno Lodge is an adorable 1 bedroom house located on a private pond with the grounds. Samuelle just finished renovations of this property and we would love to go back and stay there. It's just the right size for a couple. We did not get a chance to use the hot tub or sauna but they looked like a lot of fun. She is currently building an indoor swimming pool in another one of the buildings. I can't wait to go back and stay there again. I highly recommend all three houses on this property. Our family stayed at Samuelle's house for a week. It was marvellous. The house is beautiful with really high standards in all aspects - beds, bedding, kitchen, furniture, garden, spa, etc. She has spent a lot of time and money to ensure a truly French countryside experience. Besides the house, Samuelle is a terrific host - she was so helpful and was so full of enthusiasm that it was contagious. She hosted a evening of drinks with our group and the other people who stayed in another house on her property. It was a great time as we met her terrific children and got to learn about Germany from her other guests. If you are staying in Normandy, you must stay here as it a slice of real French life. The house is central to all the Normandy beaches and about 10 minutes from Isigney-Sur-Mer where you can shop and go to restaurants. Also, please remember to order your fresh bread each morning - it is delivered to your kitchen window. Vouilly, France...one probably wonders just where it is. Only about 25 km from Bayeux, this small village is one of the most beautiful vacation rentals one can imagine. It is worth the drive off the beaten path. Le Close Blisse-Utah House was truly a home away from home for four of us in mid-October. The owners of this property have created an exceptional rental property. This accommodation is part of a 1790 farm and all the renovations make it a one of a kind rental. The kitchen is gourmet with all the appliances to make you want to cook and seating for six easily. There are three bedrooms, one large master suite with a rain head shower on one floor. Two bedrooms on the top floor share a bathroom. One bedroom has a king-size bed, the second is large enough to have four twin beds with quite a bit of extra room. It makes a great family rental. It is only fair to mention this home is on four levels. This said we were four seniors and managed quite well. The large kitchen is entered from a large enclosed back yard complete with patio and a barbecue. There is a single toilet-sink on this level and a washer and a coat room. The second floor is just as the picture shows...a more formal dining area and an extra comfortable living room with a fireplace stocked with wood, with a wood pile nearby. There is also an a television with Apple TV. All the furnishings are antique to modern and they compliment French Country living. If you want a night spot, this is not your place. Everything about it makes you want to relax and enjoy your stay. That said it is ideally located to travel to Mont Ste Michel (about an hour and a half drive away) and a fantastic day trip not to be missed. The beaches of Normandie are maybe 9 km away. We spent two days touring all the experiences of D-Day, 6 June 1944. Historically and emotionally it is an experience not to missed or rushed. Bayeux is a great city with cobbled streets, lots of shops and dining experiences and a really picturesque river walk. Two attractions NOT to be missed are the Bayeux Cathedral and Tapisserie de Bayeux. The owners have recently completed a separate accommodation which has at least four bedrooms with an exceptionally large living space--andeven more gourmet kitchen (yes, it is possible). Next year they will have turned the old bakery into a one-bedroom guest cottage. Do yourself a favor and take advantage of their hospitality. A plus for us was they speak English. Beautifully appointed, immaculately maintained home & grounds! The home & all its amenities were absolutely spectacular. Set in a beautiful rural setting with pastures & pond! The owners are wonderful & very accommodating.. We were treated like part of their lovely family & felt very welcomed & special! My family & I would highly recommend vacationing in this gorgeous home!